A cute but practical Hot water bottle cover, made from a thick vintage 100% NZ wool blanket, handmade in NZ, to my own unique design. 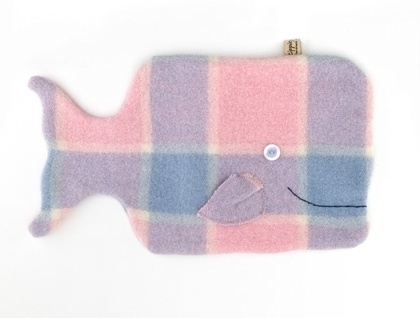 A happy Whale Hottie Cover made from vintage 100% Wool blanket. Features hand stitched smile and button eyes for extra homemade feel good craftyness. I got the idea for this hottie cover after I was recently reunited with my favourite golden book "the happy little whale". The colours of the illustrations of the book match the colours of the vintage blanket perfectly, and so the happy whale hottie cover was dreamt up. Features a flip top tail for easy filling/removal of hotwater bottle. A great cuddle buddy to hug on cold winter nights and can be used as a pyjama storage case over summer! Eco Sustainable design using upcycled vintage wool blankets, plus you'll be saving the whales with your energy saving ! I have more than one availlable, each one is individually made and has slightly different pattern placement,I also from time to time have whales in other colourways. I also make an owl, a piggie, a bear, a dog , a monster and other cute hottie covers. Cover only, fits standard hotwater bottles.